For the vintage football collector, football photographs provide a treasure trove of information on equipment, uniforms, and even team formations. When they are dated, vintage photos time stamp the artifacts we collect today. When they are not, a general knowledge of equipment evolution can help narrow the range of the estimated date of production. Head harnesses are a great indicator of age when they appear in a vintage football photograph. Typically, the photo was taken within a year of the production dates of the harness. For Spalding and Reach head harnesses, I have compiled visual evolution charts that estimate the manufacture dates for each of their models. When several models of harnesses appear in the same photo, dates can be narrowed further. For harnesses of other manufacturers, reference can be made to the 1894-1925 Head Harness Rarity Chart, which estimates the dates of production of each harness style. For example, a photo of a player holding an 8-spoke head harness would be dated post-1905, which is the first known date of introduction of this style. 1897 football photo including No. 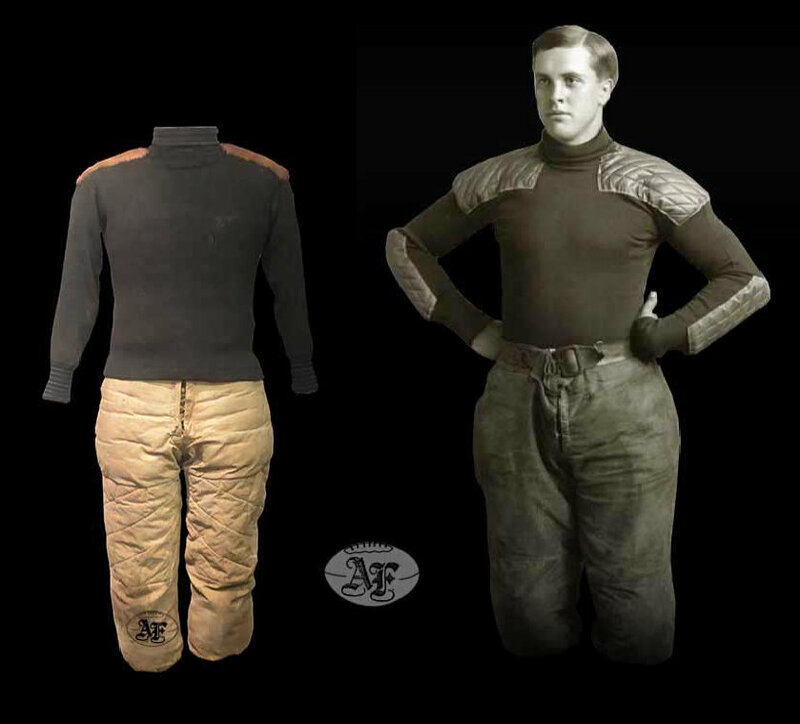 35 head harness (1896-1903), 3-hole Morrill nose mask (1892-1900), and quilted football pants (1890-1910). Football pants in the 1870's and 1880's were either whatever thick pant a player owned or canvas or moleskin work pants with a thick lining. By the early 1890's, quilted pants became available nationwide in sporting goods shops and catalogs and quickly became a standard piece of every player's uniform. 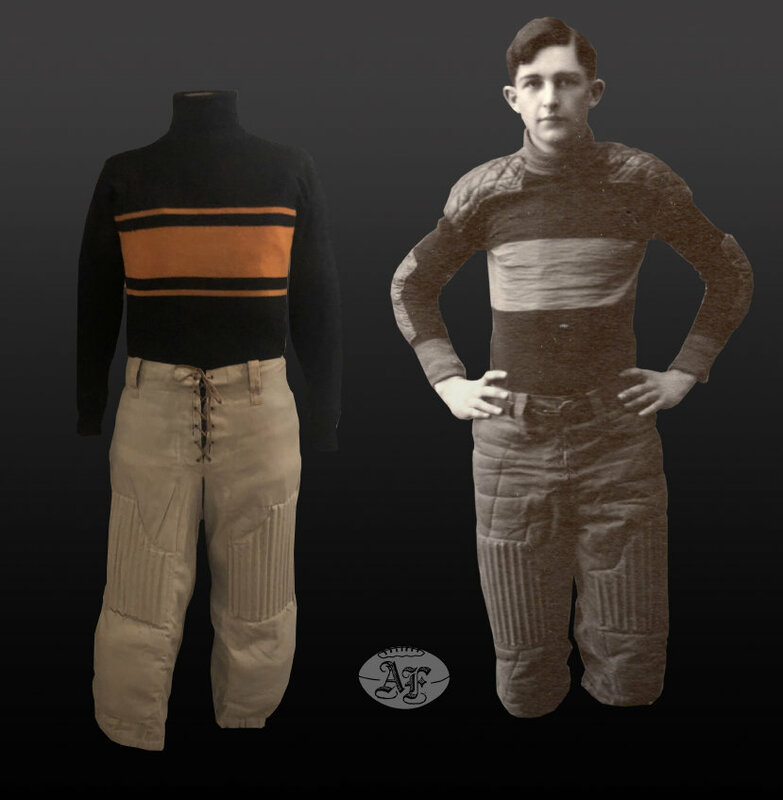 By 1900, reeded pants began to supplant quilted pants, becoming the standard pant for most college teams. Pants with removable pad inserts were introduced in the early 1910's and continued to be used until the mid-1920's. In the 1870's and 1880's, players on both teams wore long sleeve canvas jackets that were laced tight to the torso to reduce the amount loose fabric that could be grasped by an opponent. With both teams wearing similar colored jackets, knit caps and skull caps of distinct designs were worn to tell teammates apart. During this period, it was not uncommon for players to cut their jacket sleeves to make a short sleeve jacket, or remove the arms altogether and wear the jacket as a vest. By the early 1890's a "jacket without sleeves" was sold as an option by most sporting goods companies. Players began wearing striped or colored jerseys underneath the vests to distinguish teams and the knit cap and skull cap disappeared from the field soon thereafter. The canvas vest continued to be sold in sporting goods catalogs well into the 1910's. 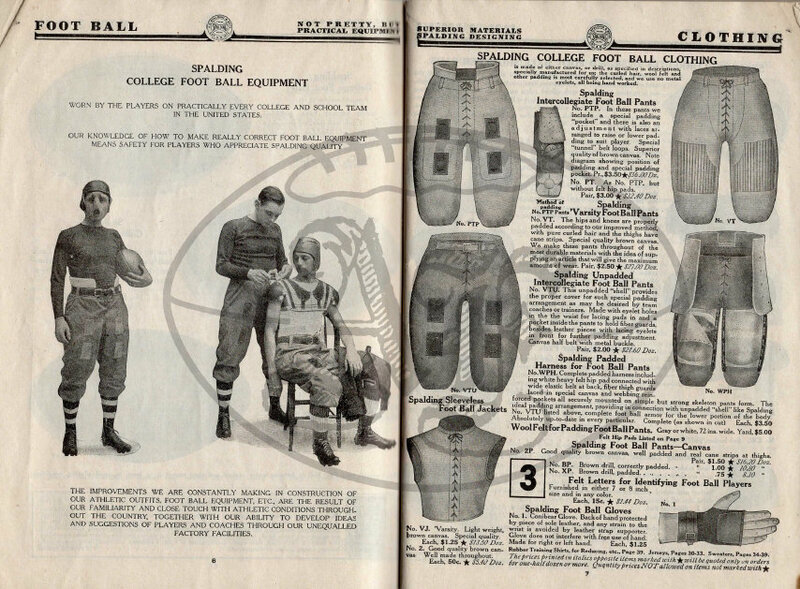 The Varsity Union Suit made its first appearance in the 1901 Spalding catalog. The suit was basically a canvas vest attached to reeded pants by an elastic waistband and was sold until 1911. Three example photos have been dated below using the equipment data outlined above.